After I put the pictures up on the blog I took the originals, put them in an envelope and walked to Luke's house. I wasn't sure exactly of where he lived, but he had given me a house number. So I rang the bell. Luke's Dad answered the door. And pretty soon I was chatting with Luke and his Mum and Dad and his little brother Liam. It's an odd and wonderful thing to find yourself standing in a neighbours house because a small boy changed the course of your day. I think we were all a bit inspired by the power a young boy can have to create inspiration and joy. They were delighted to hear about the exchange and the challenge that Luke had set me. They also were impressed that I responded to the challenge so quickly! "You have to come and see this..." His Mum said. So I was led into the lounge room to see a coffee table COVERED in drawings that Luke had done since meeting me a couple of hours before hand. 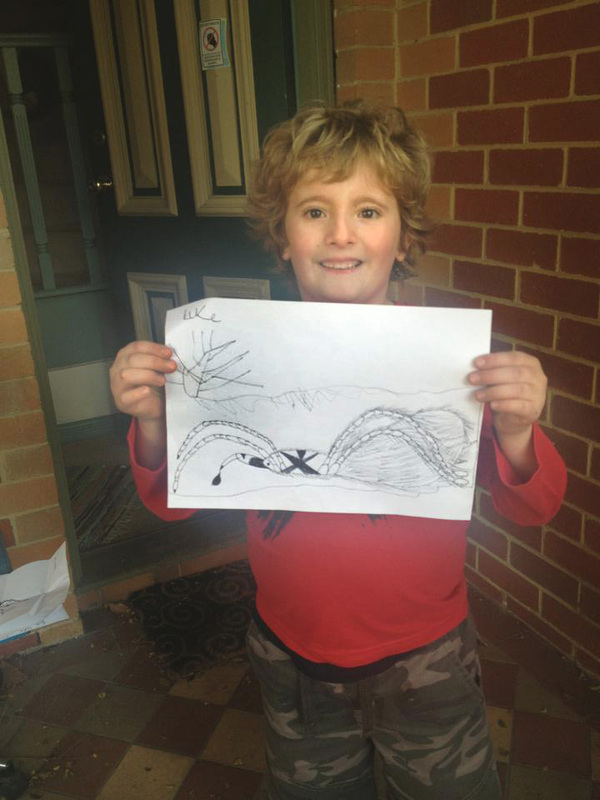 Apparently Luke had been talking about me for those hours as he drew and wanted to do his BEST work so that the drawings he put in my letterbox would really showcase what he could do as an artist. I asked if I had permission to put his pictures up here on my blog. At this point he re-examined them and decided that a few more touches would be needed before they went on the internet. Apart from the words themselves (which I immediately treasured), I loved the drawing of the insect in the bottom right hand corner. Almost like a picture mark for the artist himself. Flying bravely forward with delight! Inside the envelope are the best treasures yet: Luke's own response to the challenge complete with the final touches he promised. They are magnificent (and if I may dare say - a little terrifying in their accuracy). First up, the tarantula. 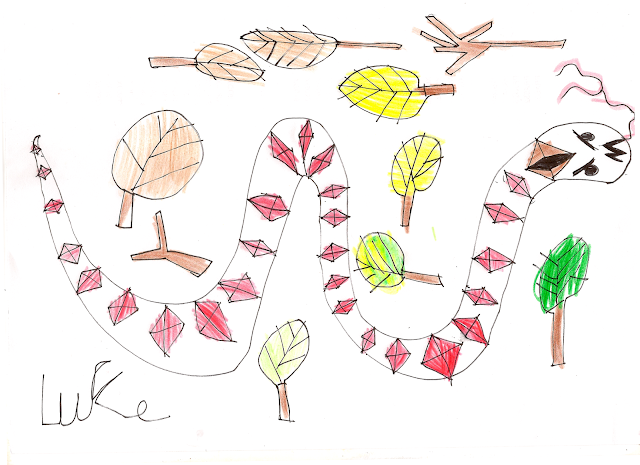 I love the shapes that Luke used to put this picture together. In fact I am AMAZED just how accurate this drawing is. 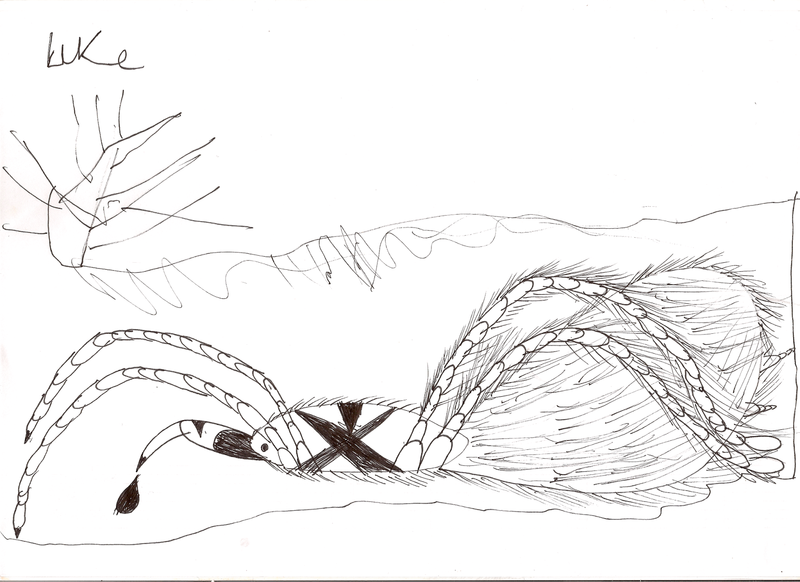 The large back abdomen, the arched legs (complete with perfectly sized and proportioned sections on each leg), the fang (with a drop of venom), and the overall texturing. "You wouldn't want to get one of those needles in your eye!" Luke warned me with a giggle. Indeed not. Did I mention that Luke is just seven? 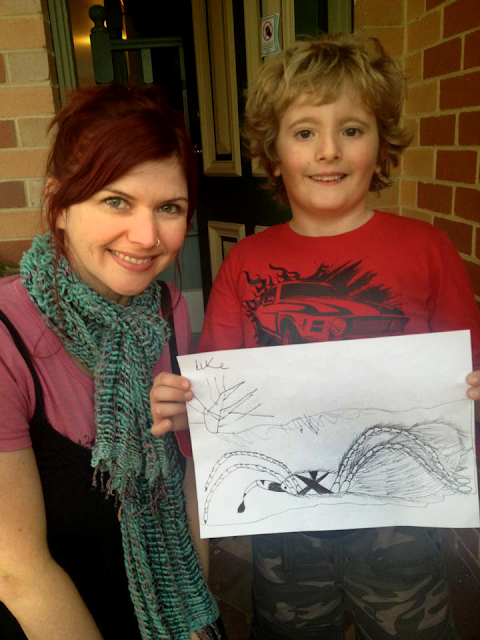 His enthusiasm and commitment to create this spider (and all of his other pictures) is truly an inspiration. And his drawing skills are second to none. Be warned... this picture of a tarantula is definitely NOT for the faint of heart! Next we have the Bushmaster Snake. We see the ferociousness of the snake in it's facial expression and it's dynamic ready-to-move wavy form. It's definitely NOT to be messed with. The leaves and the twigs give this beauty an environment in which to live and to slither about. The red diamonds on the back of the snake scream out "Danger!" And here is another picture he gave me to "look up on the internet". 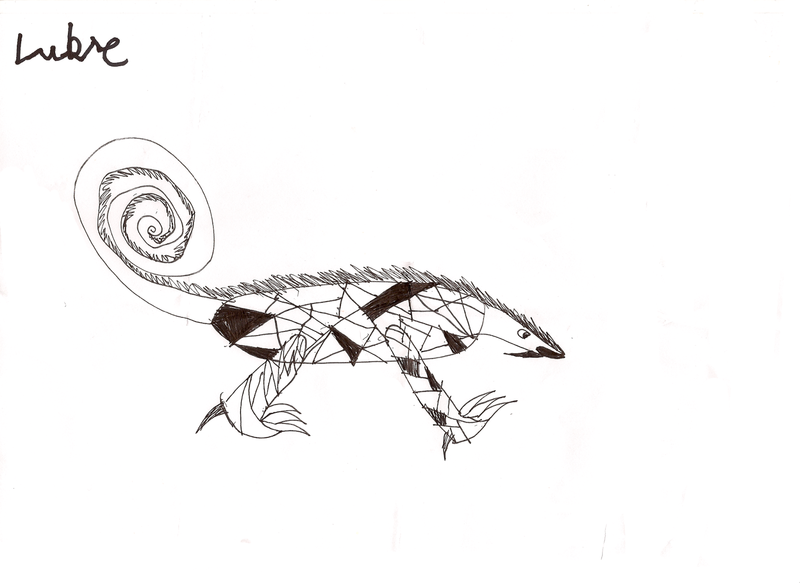 This time it's a lizard. 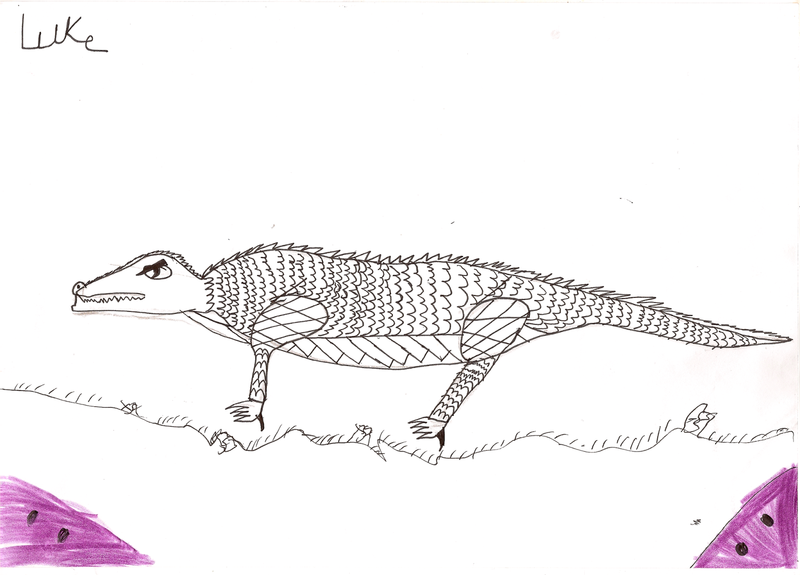 An Australian Monitor lizard to be exact. Goanna's fall under the umbrella of monitor lizard. 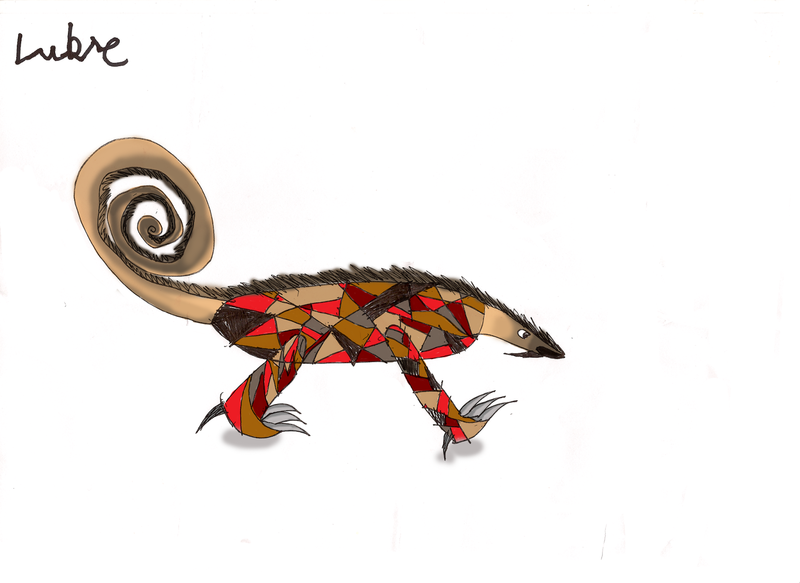 They are beautiful yet fierce reptiles. I think Luke captured both of these qualities exceptionally well. 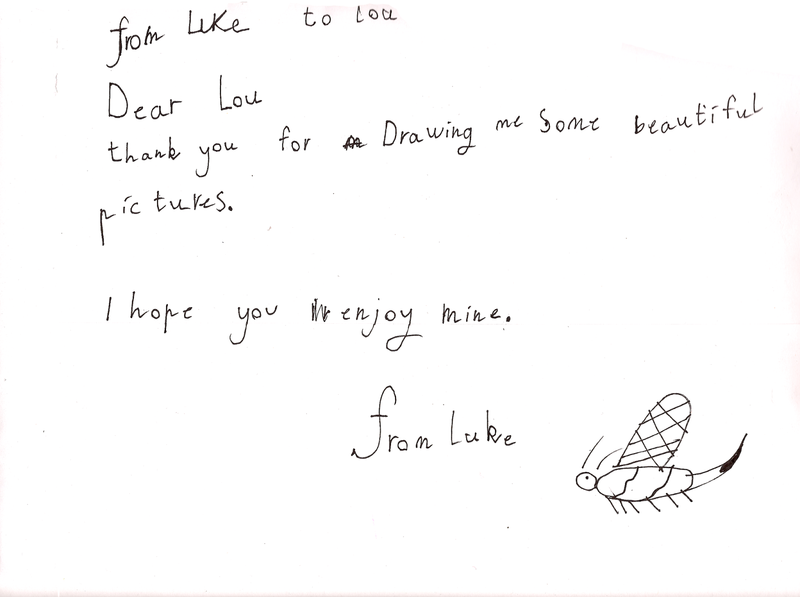 And finally, Luke's "most special" drawing of all. This last picture is of a completely new creature. Luke has lent me this picture as he would like me to copy it. "It's called a Roller Boller" Luke said. "I'll have to research this creature on the internet" I told him when he showed me. "No. You can't do that Lou. Because it came out of my imagination. So there's no stuff about it anywhere. You just have to look at the picture." And look at the picture I have. I promised I would take great care with this picture as it's clearly a prototype for something never seen before. Between you and me readers, this picture is my favourite. My weekend of inspiration and creative imaginings all thanks to my new best friend on the block. Luke and me at the front door.